Numerous critics and consumers loved the roominess of the Prio’s toe box. This Xero Shoes was adored by droves of wearers for its shocking lightness. Dozens of owners hailed the Prio as an amazingly comfortable shoe. Several users were impressed with the way they were able to feel very much connected to the ground in this footgear. The shoe having a zero drop was greatly appreciated by professional bloggers. Some testers called the footwear’s heel support excellently reassuring. This running shoe didn’t disappoint experts in terms of flexibility. A few reviewers were overwhelmed with the stickiness of the gear’s outsole. Based on a number reports, the Xero Shoes Prio runs small. Footwear pundits wouldn’t have criticized the shoe had its overall design been slightly more appealing. A seasoned reviewer wasn’t happy to discover the outsole’s inability to shed mud effectively. If the only quality wearers need in a shoe is a spacious toe box, they will not be disappointed getting the Prio. The good news is, the running shoe offers so much more than forefoot space. Indeed, among other things, it also provides tons of comfort in its superbly lightweight confines. That said, the shoe might not live up to the expectations of runners who value sizing precision in their gear. All in all, the Xero Shoes Prio delivers a promising performance—especially once its confusing fit has been successfully worked out. For the past 3 years since obtaining certification as a Running Technique Specialist in POSE method through the Romanov Institute and reading the minimalist classics, “The Running Revolution” as well as, “Born To Run” I have been alternating minimalist footwear of one kind or another into my quiver of trainers. I have tried everything from Altra to Vivobarefoot shoes and found that there are very few companies that have stood the test of time to provide a truly functional daily trainer that is flexible and thin enough to provide good proprioception but supportive enough on uneven concrete and gravel to avoid bruising and foot fatigue. 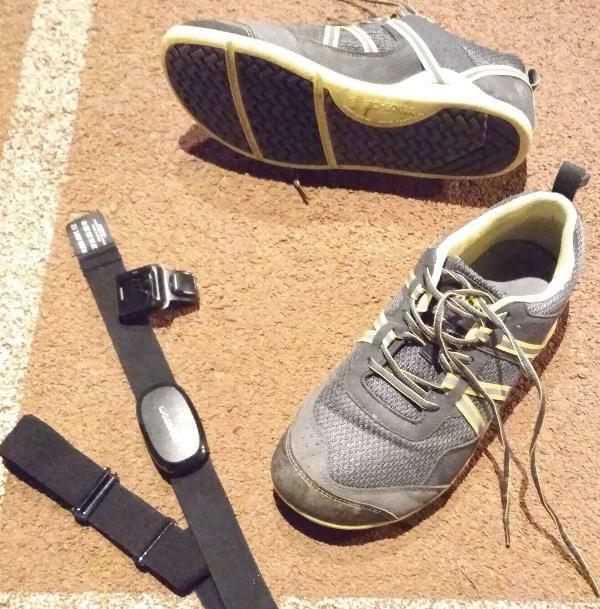 For this reason, I was truly overjoyed to be given the opportunity to try the Xero shoes Prio (a nod to the need for ground feedback) to see for myself how they stack up on the road, track and trail. While Xero is a relative neophyte in the running shoe game, they are certainly adept at producing a great upper. Inspired by their line of sandals, the Prio sports a set of, “huarache style” straps that are connected to an adjustable with the mesh upper to provide a snug and supportive feel through the heel and midfoot. In principle, they provide a small measure of structure to the shoe to avoid the loose feeling on the heel and midfoot that can lead to sloshing of the foot. This is extremely important in wide-base, minimal footwear where the formation of hotspots occurs often when wearing the shoe without socks. In practice, the straps do an excellent job of holding the foot to the shoe without creating any restriction on natural foot mechanics. One can have too much of a good thing, however, as I did notice that the top of my foot became a tad numb initially when wearing the Prio on longer jogs if the laces were pulled too tight. For those of us with an early start to the day or the night owl logging miles in the moonlight, these straps also come with a reflective coating and in a range of bright colors for safety and visibility, including classic safety yellow. The mesh material making up a portion of the upper is incredibly soft considering the low price point of the shoe (base listed at MSRP $89.99 but available in some sizes and colorways for as little as $39.99). It boasts average moisture management principles but does feel heftier after 5 or 6 miles when compared to competitors such as the Vivobarefoot Stealth and the Merrell Bare Access due mostly to the presence of large strips of vegan-friendly overlays at the midfoot in a supplement to the heel and toe caps. The trade-off is a shoe that retains its shape exceedingly well without any rigid external structure and holds up on runs in the cold without leaving your toes in the deep freeze (as we head into fall, most of my runs have been in sub-freezing temperatures, and I have not noticed much if any discomfort even when sans socks). The heel of the shoe, while not featuring any restrictive counter or excessive foam padding does well to remain supple yet breathable with a mesh-covered collar. It allows for natural rearfoot movement yet is firm enough to avoid a collapsed rear portion of the shoe such as plagued early models of the Kinvara from Saucony and recent models of the Trail Glove from Merrell. As a former shoe fitter, the pull tab on the back is especially handy to avoid having to wriggle into the soft heel of the shoe. In terms of overall fit, the Prio has a unique feel. Much like the Altra Torin's of the past and early versions of the Merrell Trail Glove, the toe box has a modest ceiling, but not uncomfortably so. Its width is generous enough to allow for anatomically correct foot positioning and toe splay through the gait cycle, but the challenge is finding the proper size length-wise. Living in the midwest in a place where it is difficult to find support (pun entirely intended) for minimalism in local running and activewear stores, it took some time to be able to find a place to properly fit foot to a shoe. In general, per the Xero web page, one should go up a half size from their current RUNNING SHOE SIZE. Having tried a few different pairs, the size may vary a bit more from pair to pair, but this seems accurate for my personal needs (I measure on a 10, usually take a 10.5, and feel very comfortable in an 11). From a feel standpoint in the upper, the Prio is tough to beat, especially for a shoe that costs less than half of some of its competitors. While it feels a bit interesting to discuss cushioning for a shoe from a company that touts ground feel to the utmost, the shoe does have just enough padding to shield newer barefoot enthusiasts and veterans alike from excessive ground reaction force. The Prio has a sewn-in thin strobe of a breathable mesh nature to mirror the available insole. It is comfortable to wear barefoot without irritation from the stitching but may prove a bit much for those logging most of their miles on hard pavement and gravel roads. Nonetheless, for those looking to get as close to the ground as possible, at 5.5 mm of total clearance when removing the insole, the Prio is in line or more aggressive than both the Vapor and Trail Glove from Merrell, and just slightly thicker than the Vivobarefoot Primus and most Vibram FiveFingers models. For those transitioning to a barefoot-like experience from more cushioned minimal models, there is the option of a slim 2 mm insole that has a porous bottom allowing for good moisture management and enough plush feel to take the edge off the unforgiving concrete and gravel on the road. While most of my runs coming off of a recovery period following my last marathon have been on soft track trails and the treadmill, the Prio feels just as comfortable underfoot for intermediate runs on paved trails and city streets up to 7 miles. From how they have felt, I would have no reservation taking them farther but simply did not have the stamina with proper mechanics to take them for a longer spin at the end of my training season. That being said, this comes with a word of caution: if you are not committed to paying good attention to your mechanics and the feel of your stride, then this may not be the class of shoe for you. While this model is a welcome addition to my shoe rotation as a trainer to help work toward efficiency in my stride if you have a history of injuries such as stress fractures or posterior tibialis tendon irritation it may be better to ease into a shoe like the Prio as a daily trainer. Much like the upper, these materials in the outsole have proved to be very well designed for the long haul. After 72+ miles of use for running, disc golfing, hiking and then two 45+ hour work weeks in a busy physical therapy clinic, the shoe continues to look brand new. With a 5,000 mile warranty on the TrueFeel rubber sole, I anticipate that the Prio will be a staple in my rotation for the next marathon training cycle and beyond. Especially in wet conditions (including the first snow of the season), the grip of the outsole performed well with no slippage going over steep downhills on the in-town roads and rolling hills through the narrow track trails near my home. Even when out for a round of disc golf on a rainy mid-day the chevron-shaped lugs in the outsole kept me upright from the tee pad to the fairway with little to no slippage. It also did well-shedding debris such as sand, leaves, and grass. The only time that I felt unsteady was on a run through technical trails through my local state park when the lugs became more congested with mud. Otherwise, it was as reliable as I could hope for it to be given its design as more of a road shoe. The one criticism I had was the oddly placed flex points in the midfoot. For some reason, the second flex point seemed to be slightly offset from the end of the arch of my foot which did cause some occasional awkward feelings under the ball of the foot at midstance. In future models, potentially narrowing the gap between the toe and metatarsal flex points could make for a smoother transition through toe-off. On the flip side, the level of flexibility in the shoe has been a breath of fresh air in my Physical Therapy practice, especially when attempting to demonstrate dynamic and high-level balance and cadence drills with injured runners and athletes. The feedback from uneven surfaces felt through the thin sole of the Prio make it an ideal shoe in a rehab setting, but also for activities that would benefit many runners such as yoga, pilates, and Crossfit. Out of the box, I was not initially sure how to feel about the aesthetics of the Prio. Unlike the Escalante from Altra or even the more understated ST-2 from Topo, the Prio has a very plain feel to it with little patterning, one base color and a small touch of accent coloring in the support bands lining the heel and midfoot of the shoe. Though wide in the toe box, it has a more streamlined appearance than offerings from Vivobarefoot and Merrell. Additionally, while multiple colorways are theoretically available, a quick glance online or in stores leaves the averagely sized runner at more of a disadvantage when looking to vary up the color in their wardrobe. 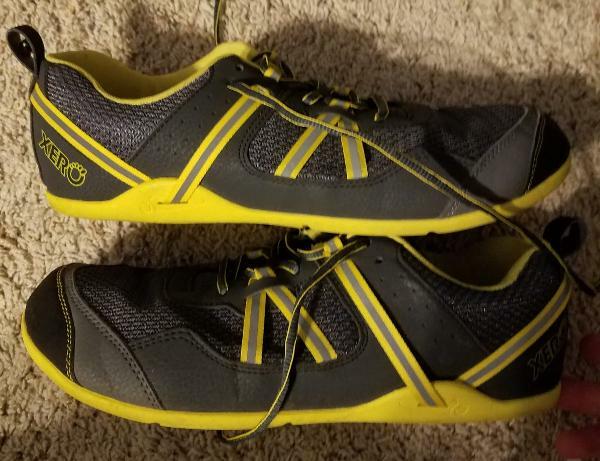 Nonetheless, no more than a week into wearing them at my local disc golf course and at my clinic, I received more compliments on the unique style and design of the Prio than I have had in the last two years for any of my other daily trainers. Fans of minimalism enjoy the low to the ground look and many patients commented on the reflective accents and textured toe caps as striking and attractive in a work shoe. While they may not win any beauty contests in my own estimation, beauty truly is in the eye of the beholder and has overruled me on this model. For the past few years, especially after transitioning to a different cadence and stride type in my running, I have been varying up the type of shoe that I log my miles in. The Prio stands as one of the better barefoot shoes I have seen not only for comfort on top of the foot but protection and feel in balance underfoot. For the purpose of review, I’d like to thank Xero Shoes for providing me with a pair of Prio shoes. No additional compensation was provided and the review process objective over the course of a normal life cycle of my daily training shoes. The barefoot and minimalist running movement first caught my attention about ten years ago. It intuitively made sense to me and have struggled with a painful neuroma (an inflamed nerve in my foot), the idea of a wider toebox held particular appeal. I am also a forefoot striker, so it seemed like a natural fit. I launched into barefoot running with enthusiasm but quickly learned an important lesson. To avoid tight calves (at best) or injury (at worst), you must give this type of running respect. Xero Shoes has advice about this on their website. If you pay attention to your form and look after your feet, they will, in turn, look after you. When combined with simple foot exercises that help to keep my feet strong and happy, I love minimalist shoes. I am not a purist, but rather rotate my minimalist shoes with more substantial low-drop shoes such as the Saucony Kinvara. I’ve enjoyed various minimalist shoes, but Merrell's barefoot models have been long-time favorites, to the point where I find it hard to throw worn-out pairs away. I hadn’t heard of Xero Shoes before but was eager to try the brand’s offering in the minimalist running shoe category. So far, I’ve hiked over thirty miles, run over fifty miles and worked out in the gym at least twenty times wearing the Xero Shoes Prio. I most appreciate its flexibility, fit and low weight (a women’s size 7 weighs 6.4 ounces, according to Xero Shoes). These characteristics make the Prio the kind of shoe that you can lace up and forget about. In short, I love it. This zero-drop shoe boasts a wide, high toe box that gives toes room to play without being sloppy. It has the feel of a high-quality shoe built to last. I followed Xero Shoes’ advice to size up by at least half a size, and the shoe is a near-perfect fit. The strap system allows you to tighten the heel. This is a very nice feature for anyone who, like me, has a narrow heel. The straps also allow you to adjust the instep if necessary. The laces themselves are a little long for my liking but do stay tied. I feel very secure in the shoe, whether I’m running downhill on the trails or lifting in the gym. The mesh upper makes this a breathable shoe. The Prio reminds me of the Merrell Pace Glove or Trail Glove, but feels just a little more substantial, with more padding around the upper. All in all, this is a very comfortable ride. The Prio is about as attractive as a ‘foot-shaped’ shoe can get, in my opinion. Shoes with a wide toe box may never look as sleek as a more conventional shoe, but it does come in several different colors. Whether you prefer your shoes to stand out or blend in, you should be able to find an option to satisfy you. The Prio also features large reflective details, which I always appreciate in a running shoe, as anything we can do to improve our safety on the roads is a plus. Notice the lacing system, which attaches to reflective heel and instep straps for a snug fit. This shoe can also be worn comfortably without socks. If you prefer an experience that is as close to barefoot as possible, this shoe might not be for you. But if you like just a little more underfoot, it is a fantastic option. The removable insole provides some additional cushioning. Due to personal preference, I’ve used the insole for the vast majority of my runs. The removable insole definitely adds a little extra comfort to the ride. For roads, gyms and non-technical trails, this shoe is great. The sole is a fascinating design that I’d never seen before. Normally, the tread of a shoe runs to its edge. The Prio sole, in contrast, has a rim, or outline, of smoother material. While I was skeptical about this feature, it’s not at all noticeable when wearing the shoe. I’m curious to know the reasoning behind it. The Prio has a unique sole that provides sufficient traction in the gym, on roads and easy trails. The thinness of the sole means that you will feel larger rocks underfoot, but that’s always a trade-off with minimalist shoes. With these things considered, I do not recommend taking the Prio on wet surfaces or technical trails. The sole allows for a nice level of ground-feel but also offers some protection, which is a tough balance to strike. Without the insole, the feel underfoot is similar to the Merrell Pace Glove. Add the insole, and it reminds me of the New Balance Minimus shoes I used to run in. However, this shoe has already proved to be more durable than the Minimus. The sole is extremely flexible in all directions. The Prio leaves your foot free to flex in any direction it wants to. It also packs into a bag or suitcase easily! In summary, I am very happy with the Xero Shoes Prio, a straightforward, enjoyable ride. The company stands by its product with an impressive warranty. Despite the simple look of the shoe, a lot of thought has clearly been put into every little detail. I’ll be excited to watch out for Xero Shoes’ future models. First time I heard about Xero Shoes Prio was when I opened my mailbox with a new batch of testing shoes. I quickly skimmed through the shoes that were offered for testing and closed the email because I only wear barefoot and minimalistic shoes. For some reason, I opened that email later that day and to my surprise, I found out that Xero shoes were zero drop! The reason I did not notice in the first place was that they don’t look minimalistic. Rather, they look like a normal pair. That had my attention and that's when I checked their website. I could not overlook all the five-star reviews. They were so many! How come I’ve never heard about this company? I don’t know and at this point, it does not matter. I chose my pair and waited for them to arrive. By the way, Xero shoes Prio come in a variety of colors: yellow, blue, black, red. Just a few days later I was pleasantly surprised to have a package waiting for me at a local post office. That was a very fast delivery considering I live overseas. Anyway, when I opened the box, there was a pair of shoes and a note from the owners which is always a nice addition. The surprise was in the form of plastic shoe-stretchers inside the shoes to prevent deformation. Nice! Xero shoes Prio come with removable insoles and I will mention them later. Xero shoes Prio made a very good first impression. As I inspected them closely, I saw a fine craftsmanship that reminded me of hand-made quality shoes. The stitching looks solid as well as gluing of the sole. There was not a single hint of a hole in between the sole and the upper and neither a hint of excess glue. There's a slight perforation and a net on the top and side of the shoe for ventilation. Unfortunately, I cannot say how well it works during warmer months as I was testing them during autumn, but they served perfectly fine during this time of the year. Occasional jumps into water or a light rain is not a problem either. While some water got in, I did not feel like my feet were wet. Aforementioned stitching on the front of the shoe serves as a toe protection and it works very well. Not that I tried to kick into things but I managed to hit my toes once or twice during my testing over 100km and it was perfectly O.K. Bonus points for shoelaces, which hold perfectly! There are also reflective streaks along the sides of the shoes to provide more security during nights running outside. When it comes to fit, they fit a bit more like traditional shoes than barefoot shoes like those from Vivobarefoot. At first, the toe-box felt restrictive to me, but after breaking them in, they feel fine. Just make sure to follow the instructions of the producer and size up! Even when I followed their recommendations, I would probably feel better with one size bigger shoe. Xero Shoes boast of a 5,000-mile warranty on the sole!!! That is something to talk about. That is something many runners will welcome. Here's a picture of the sole after 70 miles of running and two weeks of walking. You can immediately notice, that the rubber used is pretty sturdy, which is a trade-off for lower traction. Prio holds well on roads and even light trails thanks to the tread but don't expect them to be extra grippy on wet rocks, pavement or bridge constructions. On the other hand, the rubber seems to be getting a little softer as I am logging more miles. On top of that, there seems to be no visible wear after the first 70 mi /100km. When it comes to cushioning, they feel really protective with the insoles inserted. Everyone who runs a lot on pavement and roads will welcome that protection even in a barefoot shoe. While they give you some more protection, you still remain in touch with the ground. After testing the shoe on the pavement, roads, running track, and mud/leaf covered areas that the autumn weather provides, all I can say is that Xero Shoes Prio is worth all its five-star reviews. While I would appreciate a little wider toe-box that I got used to in Vivobarefoots and Vibram FiveFingers, I don’t feel restricted either. I love to wear them for running as well as walking around the city. The Xero shoes Prio do their job very well, be it for a casual walk or in fitness related events. The last bits of improvement I see is in making the sole more grippy, which would mean using a softer and less durable rubber. I live just a ten-minute drive from the world headquarters of Xero shoes, but I had never heard about them until I re-read Christopher McDougall’s 2009 best-seller "Born to Run" and started searching for terms like "huarache", "barefoot running or zero drop", a couple of years ago. I was impressed with their guarantee and online reviews, so I gave the Xero Prio a whirl in January 2018. The first thing I noticed out of the box was that the shoes looked sturdily put together, for something so minimalist. You can certainly roll them up and tuck them into themselves, and they pack down to about nothing. They weigh half of an average running shoe. The stitching is even, and the materials seem tough. They are made of "vegan-friendly materials," according to Xero’s website. The Prio is double-stitched at the toe and instep, just where it needs to be, and there is just enough reinforcement at the toe. The reflective strips are thoughtfully placed to add a little safety at night runs or road crossings. The Prio is a little narrow through the midfoot, with a bit more generous space in the toe box. Their soles wrap just a little into the uppers. Their width seems widely adjustable. Thanks to a strapping system adapted from Xero’s sandals. The moment I slipped these on, I immediately felt everything underfoot. Not in an evil, poky way, but I was instantly aware of surfaces. After the cushy feel and 10mm drop of the Brooks GTS that I had become addicted to, this was an entirely new way of approaching running. I began with a few walks and worked to shorter runs. The result was sore calves and a shorter stride with a natural tendency towards mid- to forefoot strikes. I have never run with them regularly, but they have settled into a once-a-week rotation of walks and runs that seems to challenge entirely different muscles. Durable? Yes, it was an easy 300 miles with little discernible wear. The reflective surface has rubbed off a little from the outside of the heels, but that is all of the cosmetic damage they have sustained. There's no foam to break down, and the tread seems to be indefatigable. There's no support and scant cushioning (an optional 2mm insole), so the shoes absorb little shock. They require different running technique, which means less stress on the shoe and rethinking just mindlessly pounding pavement. The few millimeters of internal footbed do seem to be compressing a little, but that’s the only real wear point I can detect so far. I stopped counting, so I won’t test their 5000-mile sole guarantee. Being naturally hard on footwear, I unintentionally tested their warranty a month into owning the Prio. I laced them a bit too tightly around my low-volume forefoot and ripped through the rubber slot holding the straps. Their office staff was responsive and impressed that I had managed to stress the shoes in that way. They immediately offered to replace them, despite my admission that it was my own damn fault. I think the shoes were so lightweight that I felt like I might lose them if I didn’t tie them on securely. Loosening up a bit has not resulted in any shoe ejection. So why review them now? The design of the Prio has not changed in the past year. Obviously, they never became the go-to shoes I have since replaced four or five times. I don’t wear them for a lot of miles, but I still seem to reach for them in a lot of situations. After I finally understood not to cinch down the straps, their gentle strapping system (inspired by those huaraches) has proven to be comfortable. They ironically work well as recovery shoes when the dogs are swollen and barking from too much running on those cushy cousins the folks at Xero were hoping to replace. The Xero Shoes Prio is a minimalist running shoe that allows users to have more ground intimacy but with less restraint. Its lightweight upper is engineered with reflective straps which give the wearer visibility during night adventures. This vegan-friendly footgear is equipped with the FeelTrue sole for surface traction. It has a non-elevated, low-to-the-ground design called Xero-drop to give wearers balance, proper posture, and agility. A low-cut, wide-toed running gear for men and women is the Xero Shoes Prio. Its sizing selection consists of half and full sizes. It comes in standard width. The footwear runs small according to Xero Shoe, so purchasers are advised to size up (either a half or full size larger) to get the right fit. Its lace-up closure with reflective straps provides a secure lockdown. Delivering enough slip resistance on the trail is the shoe’s 5.5-mm FeelTrue rubber outsole. V-shaped lugs engineered at opposing angles populate its surface, enabling runners to plant their feet on unpredictable terrain with the right amount of grip. This outsole configuration is also utilized in the Xero Shoes TerraFlex. For extra cushioning underfoot, the sandal comes with a 2 mm thick removable insole. It has a cupped heel design to keep the rearfoot centered as much as possible. The Prio’s low-top upper is made of a lightweight and flexible synthetic material. Its ankle cuff and tongue are adequately padded for additional comfort. For breathability, its sides and forefoot come with perforations. For extra toe protection, on the other hand, its front tip is engineered with a sturdy rand. Completing the upper of this Xero Shoes running gear is its lacing system. Regular lace holes and fabric loops make up its combination eyelets. The fabric loops, in particular, are integrated with the shoe’s reflective straps.